How much activity does the average dog get? 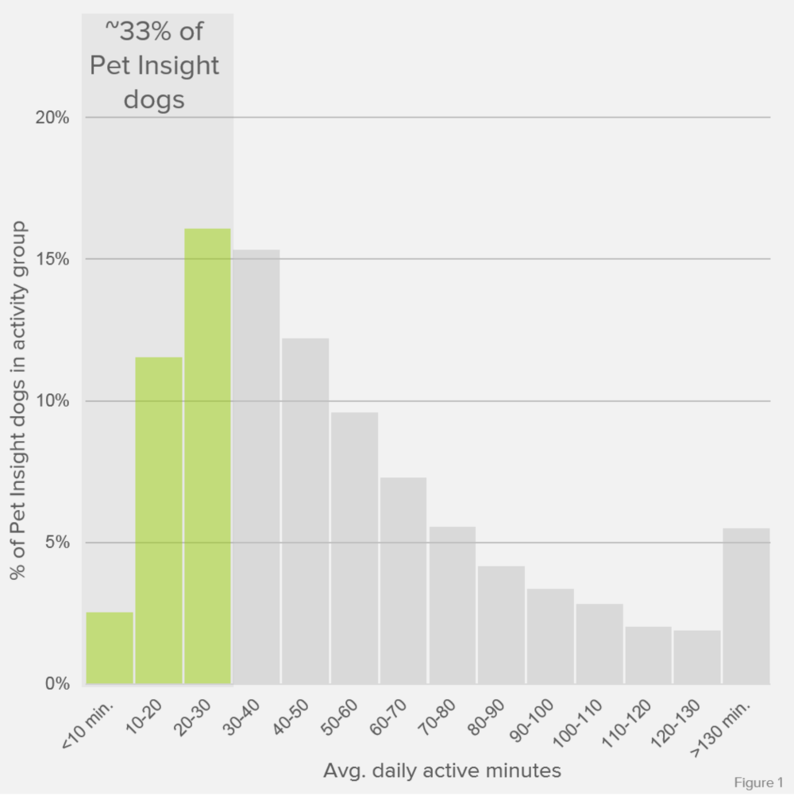 INSIGHT: Around 1/3rd of Pet Insight dogs average fewer than 30 active minutes per day. WHY IT MATTERS: Many dogs are not receiving enough physical activity to reduce the risk of health issues. Expansive research initiatives have determined that 30 minutes of daily activity is the basic requirement for most humans to reduce the risk of many health issues, including diabetes, cancer, and all-cause mortality. Dogs seem to need more activity than humans, but large portions are not hitting even the minimum requirement for human activity. INSIGHT: Puppies are more than twice as active as adult dogs, but their activity quickly drops as they mature. WHY IT MATTERS: Your dog may spend the day on the couch when you think they are running around the backyard. Many puppies develop a reputation for bouncing off the walls and being in near constant motion while awake. Owners often provide access to a backyard or dog run, and assume that the dog will continue to amuse itself while they are away. However, the data shows that once the puppy reaches physical maturity (6-24 months based on breed size), the amount of independent movement slows considerably, and the dog now requires the encouragement of their human - maybe a game of fetch or walk - to rack up activity minutes. INSIGHT: Fewer than 25% of adult dogs get over 60 active minutes per day. WHY IT MATTERS: You may be overfeeding your dog. The portion guide you find on the back of many packages of pet food is often based on the assumption that the average dog gets an hour of daily activity2. Given the average adult dog participating in Pet Insight gets ~33% less activity than the assumed standard, many dogs are burning fewer calories than they are taking in. 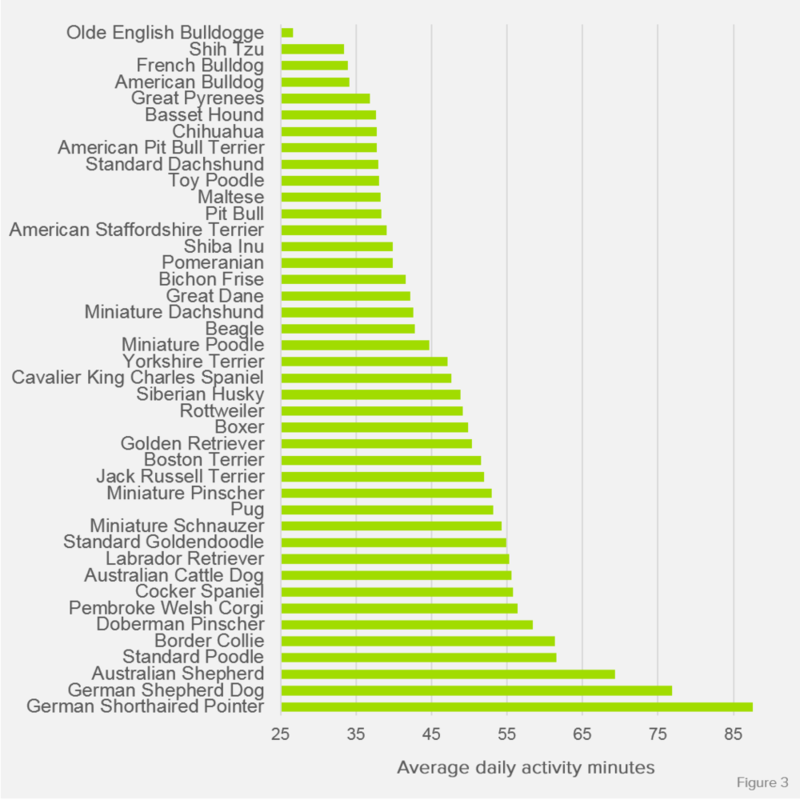 INSIGHT: There is over an hour difference in average daily activity between the most (German Shorthaired Pointer) and least (Old English Bulldogge) active breeds. WHY IT MATTERS: There isn't a simple rule-of-thumb for a dog's activity needs - your dog may be more active than most dogs but still below-average for its breed. While some of the physical differences between dogs are very clear, the variability in ideal lifestyle is less obvious. If possible, choosing a dog whose activity needs match the environment and regimen you're able to provide can create a more harmonious life. Perception vs. 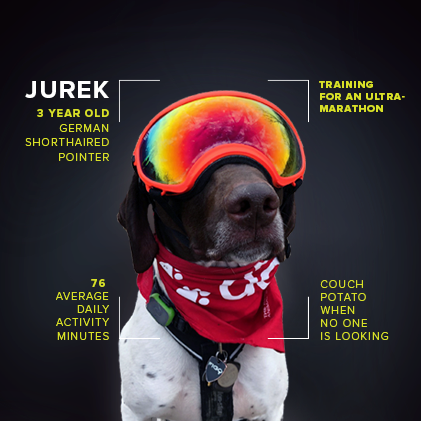 Reality: Is your sled dog dog actually a couch potato? 2 Many pet nutrition providers use the energy maintenence requirement (MER) calculations from the National Research Council's Nutrient Requirements of Dogs and Cats to create weight-based portion recommendations. The most commonly-used MER formulas are derived from studies of dog colonies in research settings, which often have regimented activity schedules with at least 60 active minutes. Figure 3: Depicts average daily active minutes of adult dogs (1 - 7 year old). Includes breeds that have at least 100 dogs with over 30 days of behavior data. Excludes breed mixes.